Seeing your kid making words is such a thrill! Have you tried holding his hand in yours to steady it? Some kids love it, because it allows them to write or draw more complex things quick. 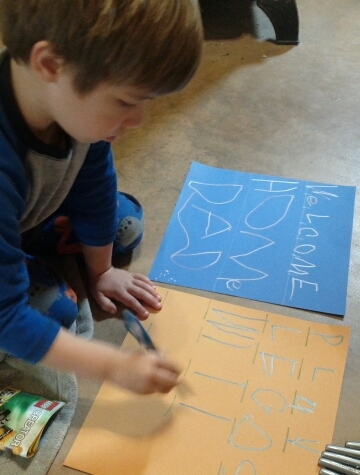 This is sort of like the Montessori idea of tracing textured letters, but more alive and open, because you can follow your kid’s direction, rather than the kid following existing lines. We have a picture of this in the Moebius Noodles book on page 62, about drawing grids. Haha! I think Grids is on next weeks schedule!